Paddington station in West London is currently and has been for years, under a considerable amount of construction and re-generation. 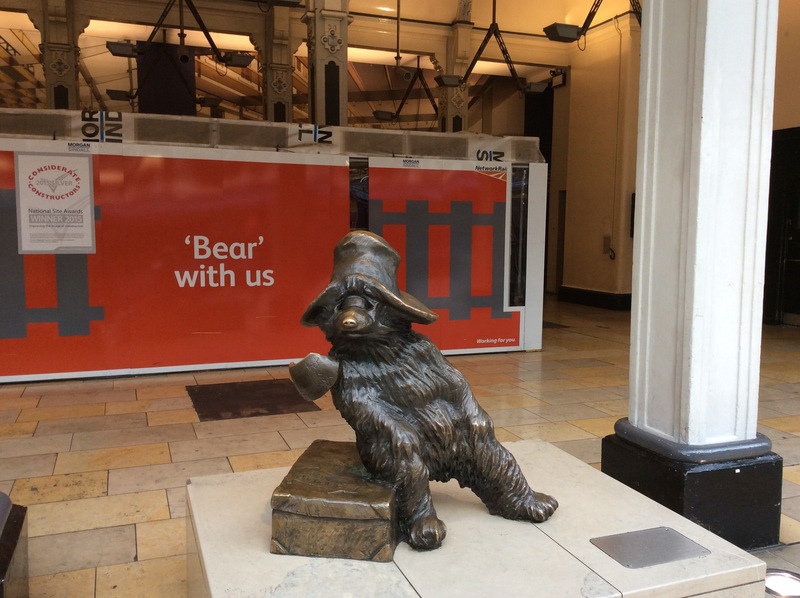 Yet it is not, and never shall be, without its beloved statue of a bronze bear; a statue no other station can boast of, Paddington Bear. Paddington loves marmalade and is so very frightfully polite, yes sir; he later acquired a pair of red Wellington boots and was adopted by a London family, the Browns. What a lovely little face, floppy hat, big paws and shaggy coat and with such charming manners. He’s looking out at all the trains pulling in under the vast Victorian iron archways, staring bemused at a 21st century generation of preoccupied lives; the frantic crowds, busying this way and that; he’s just waiting longingly for a hello and how’d you do. Many London children were evacuated from Paddington station to the country during World War II. With labels around their necks and a small suitcase of meagre possessions, they were transported safely away from the city to new homes; this too was the inspiration for Paddington’s own label.